February is Age-Related Macular Degeneration (AMD) and Low Vision Awareness Month, a yearly reminder of the symptoms and risks associated with the leading cause of vision loss in the United States. 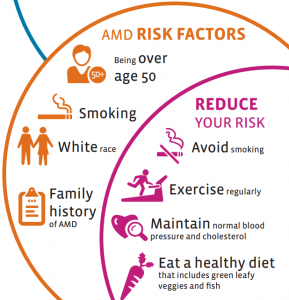 AMD is a currently incurable condition which affects more than ten million Americans, more than all those affected by glaucoma and cataracts combined. The combined risk factors of age, gender, ethnicity, and genetics can cause a gradual and often undetectable impairment of vision that impacts independence in daily living. Caregivers, loved ones and home care aides need to know the early signs of AMD so that seniors over 50 can manage the controllable risk factors associated with this condition. Macular degeneration is a progressive condition that affects the macula, the part of the retina in the back of the eye that allows us to see directly in front of us clearly and sharply. This central vision starts to blur, sometimes imperceptibly, and leaves peripheral vision intact. In people over 50, the onset of AMD can seem like the simple effect of aging on the eyes, and the progression can be so low that patients don’t even notice a problem. In other cases, the deterioration is so fast that it apparently happens overnight. About 85% of AMD cases are ‘dry’, where parts of the macula can die, and debris bodies called drusen can form in the eye, causing the macula to thin and dry out. ‘Dry’ AMD tends to progress more slowly than ‘wet’ AMD, which is caused by the growth of abnormal blood vessels under the retina and macula, causing them to bulge and lift. The degeneration of sight is much faster in this case, because the growth of the blood vessels distorts the surface of the retina and macula. Ten to fifteen percent of all cases of AMD are this ‘wet’ type, and have a high risk of affecting both eyes eventually. Smoking both constricts the blood vessels, reducing oxygen levels in the eye, and prevents absorption of an antioxidant that protects the retina from harmful UV light. Exposure to sunlight and UV rays can damage the retina, causing AMD to develop, and speeding its progression once it does. Healthy diet and regular exercise contribute to good eye health. Lots of green leafy vegetables are more important in this context than carrots, no matter what Grandma used to say. Caregivers and home care aides whose loved ones are already dealing with the symptoms of age-related macular degeneration can find helpful resources for living with AMD from the Prevent Blindness organization. As doctors continue to work on slowing down and eventually curing AMD and low vision, good eye health and good overall health remain the best ways to stay focused.